“Update” I just want to rant a little about Foam-n-More! This is an update on the post below. I found out why they did not ship the foam with the cover. It turns out the cover is a inch smaller than it should be! I think they didn’t send the foam with because they knew that the cover was small and maybe if they sent them seperate we wouldn’t realize. What a joke! These people aare the worse I have ever dealt with! Do not use these people! 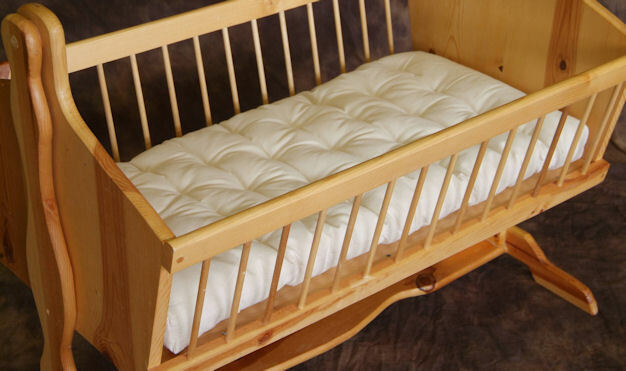 I had Foam-n-More make a mattress for the cradle I made for my granddaughter. They couldn’t have messed it up more. First they sent the cover only and not the filler. So I had them send that and it took an extra week. So they finally got the foam and it does not fit the cover. So now it makes sense. They sent the cover without the foam because it did not fit and I think they thought somehow we would’t notice it! The baby is due today, yes TODAY, and they do not have a matress for the cradle I made them! I am totaly pissed! Foam-n-More is the worst. I have to say so far they have been nice on the phone but no apologies. Unbelievable that I went against the bad reviews and ordered anyway. I thought that this was such a simple order and I couldn’t see someone in the buisness of making these things that they would mess it up like this. I ordered early just incase it took a long time. I guess not early enough! So I will call tomorrow and see what they do. I will update when I know what is going to happen. Wish me luck! Next Next post: Found a bunch of Woodworking Mags!